What does the program/investment include? ...to experience a full mind, body, spirit reset. Over the duration of this program our team of instructors will hold space for your personal growth. We will help you to create and build upon a foundation of mindful movement, meditation and nutrition specific to your own needs. As a community we will offer support in shifting old patterns, while creating new daily rituals that nourish the idea of where we have the potential to be. 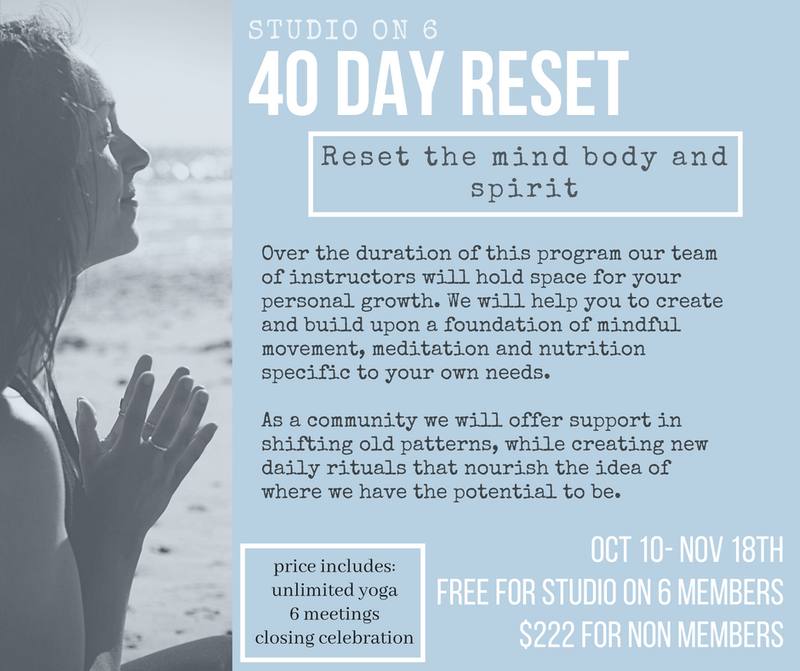 You will have unlimited access to Studio on 6 yoga classes, a weekly check-in to support the mental, physical and nutritional reset we’ll experience during this 40 day program, and a team of instructors ready and willing to offer insight and accountability. What does it mean to reset? When we are born, our bodies & minds enter this earth plane untouched by habit & conditioning. As we grow, we become exposed to conditions, trauma, foods, toxins, and habitual patterns that can bring us into a state of imbalance. We reset to bring ourselves closer to our original state. To peel back old patterns, and hold space for new habits to form.